Firstly, I hope everyone's had a lovely Christmas. It's not all over just yet through, as we still have New Year's Eve to get through, and so far I have to say that my holiday season has been a bit, er.... rubbish. My sinusitis hasn't fully gone, so I've suffered through the Christmas season with the feeling that I've got a head cold from hell. It left me feeling a little, well, like Bad Santa (hence the Picture Of The Week). My plans for a more seasonal Picture Of The Week went slightly awry - thanks to my sinusitis and Manchester's usual seasonal weather (it rained). I resorted to some very obvious photoshopping to convey how I felt. Bah Humbug! Nevertheless, I was determined not to have my whole Christmas ruined. 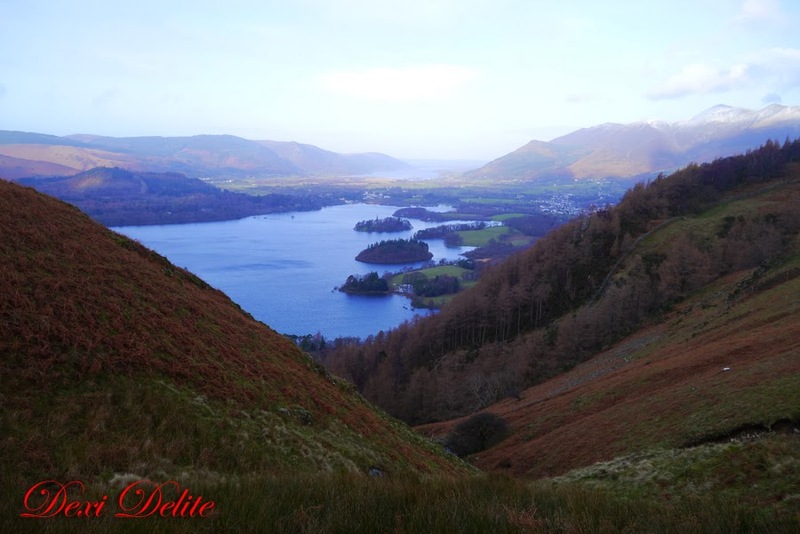 As some of you may remember, every Christmas Day a small group of us pack a car and head off to the Lake District for an early morning fell-walk. 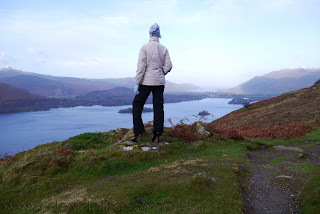 Last year it was Loweswater. 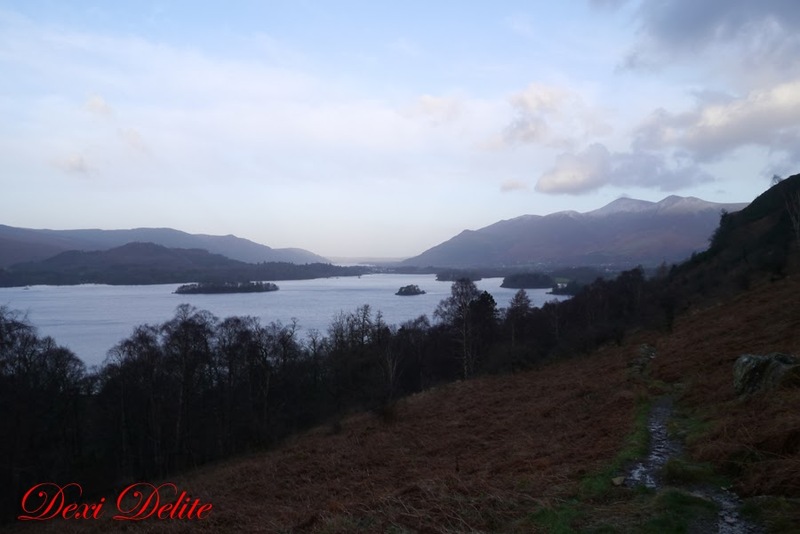 This year the plans were for a decent hike up Walla Crag (1200ft high and 5 miles long) near Derwentwater, but my slightly poorly condition meant that this was changed to the shorter and slightly easier Falcon Crag (900ft and 3 miles), again on the east-side of Derwentwater. It was a very early start at 7.00am on Christmas morning, and by 9.00am we had parked up in the designated car park and beginning our walk. The first past of the walk takes you across the bottom of Falcon Crag, the way made difficult by the numerous boulders that have fallen from the Crag and litter the area. Although not high up, I still got a lovely view down Derwentwater through the early morning mist towards Keswick. 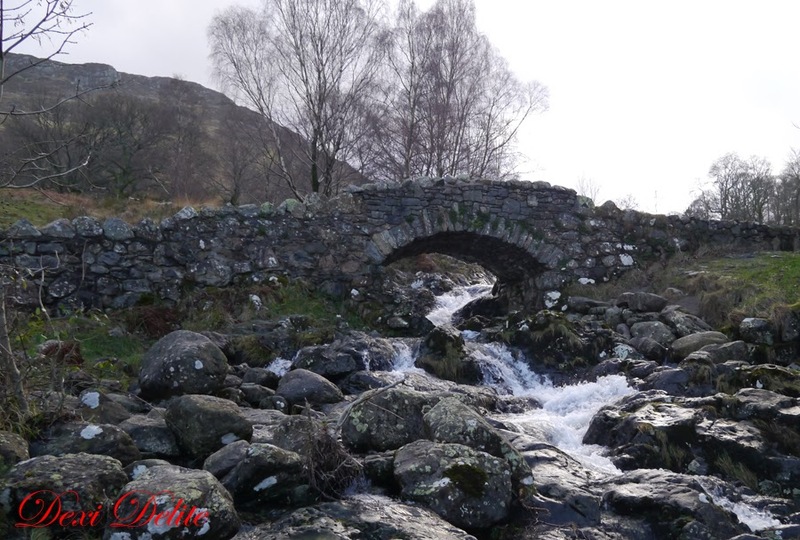 The next section of the trek took us to Ashness Bridge - apparently one of the most photographed scenes in the Lakes before heading steeply uphill towards the top of Falcon Crag. The ascent of the Crag was a bit heavy going, the buffeting wind taking quite a lot of energy to fight against, but some of the views from higher up the Crag were well worth it - the pretty town of Keswick could now be seen, and the first rays of sunshine were fighting their way through the mist and clouds. The view from the top of Falcon Crag was stunning - a clear panorama from the south shores of Derwentwater to the Keswick and the imposing heights of Skiddaw at the north of the lake, and across the lake the hills of Cat Bells and High Spy were all lit by the brightening sun. 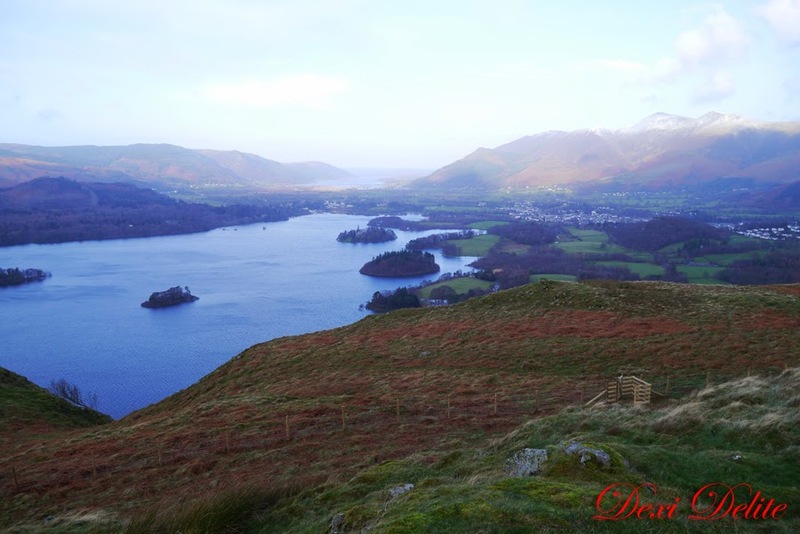 It was only a short walk across the top of the windswept Crag before beginning the descent, the walk still providing lovely views. After two and a half hours we were back in the car, a little more windblown and tired than we were setting off, but all pleased by the delightful trek. We headed back to Keswick, to finish off with a customary drink at The Inn At Keswick. 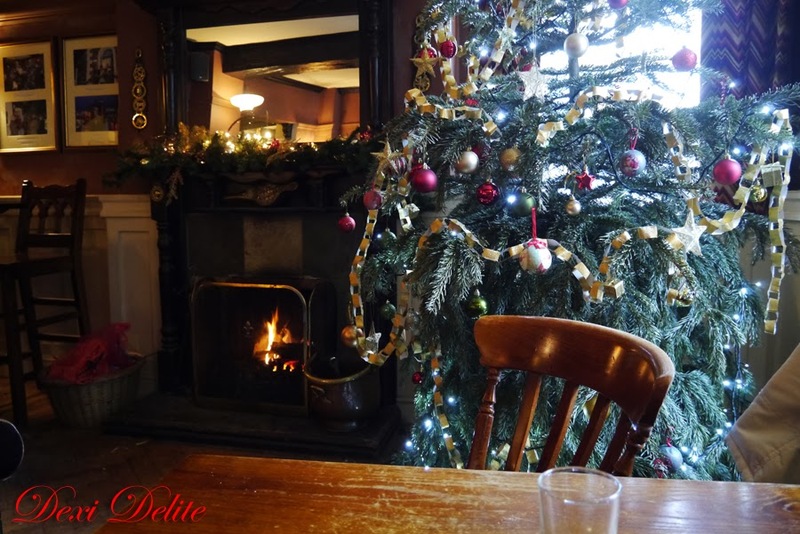 I adore this pub, and by Christmas lunchtime it is full of tired walkers, dogs and Christmas cheer. They always serve lovely beer and have a decent selection of whisky too. We managed to get in just before the crowd, and got a table right in front of the warming log fire. Perfect. ... before finding our way back on the M6 and homeward bound. A truly wonderful Christmas. As the Picture Of The Week will be up until the New Year, I'll leave you with a quick closing shot in full Pic Of The Week resolution, proving that I did get to the top of Falcon Crag despite my sinusitis and poor choice of walking boots (hehe). After a long weekend away I'm back in Manchester with my ears still ringing and husky voice from the glorious sounds of Wales. Yes, as we head full steam into winter, this weekend I was at a holiday camp in North Wales. There can only be one good reason - Hard Rock Hell. For those that do not know, Hard Rock Hell is an annual gathering of rock bands for a three-day 'indoor' festival - so, no tents, no mud, and no rain to contend with. Although this was the seventh time the event has been held, it was my first visit. Costs are brilliant - the more in a chalet the cheaper it is, (five in ours) and then you can deafen yourself from midday all the way through to the early hours of the morning, should you desire. It was an early start for us on Thursday, and after passing Chester it was required that we stopped off at the OK Diner on the A55 for some brunch. A bunch of rockers were just leaving as I walked up to the door, and caught them all having a good look (I was in my skintight shiny leggings and high-heeled boots). I smiled at them, and asked "Hard Rock Hell?" I got a loud cheer from them, and shouts that they'd hope to see me there. I bet they did. Shortly we were back on the A55 and heading through North Wales, at what point things went a little wrong. Now, I know I shouldn't judge, but when a couple of friends decided to join me for the weekend away and provide the transport, I should have been a bit worried. The last time we used his car wasn't too successful - this time the fault wasn't mechanical. After two hours of driving we suddenly hit a dead-end at a ferry terminal. "Where are we?" I asked from the back seat. "Holyhead," came the very disgruntled answer from the driver. "Isn't that on Anglesey where the ferries go across to Ireland?" I enquired. "Yes," our chauffeur replied. There was a lengthy silence. "I don't think we should be on Anglesey," I said, helpfully. There was a fair bit of swearing and cursing as we headed all the way back over Anglesey to the mainland, before finding the right road again. It was 3.00pm when we finally arrived at the Hafan Y Mor Holiday Village, and joined the queue to check-in. Once that was done, we found our chalet, unpacked, (and I administered a couple of whiskies for our stressed driver to calm his nerves) and headed off to see the opening ceremony. The first act I saw was Uli John Roth (a name I managed to totally mispronounce - Ooli John Wrote, apparently, as he's German). A guitarist in the original Scorpions rock band (as on the YouTube link), he played some unbelievable riffs on the guitar, and an old Scorpions track 'In Trance' seemed to get the biggest cheer of the set. Next up was the official opening ceremony, with freaky clowns and dancing circus girls (the theme of this year's event was the circus). I had a good look around the various stalls, too, offering clothing, CD's and music memorabilia. Friday dawned, and after breakfast I headed off back towards the main stages whilst my travelling companions remained in bed. 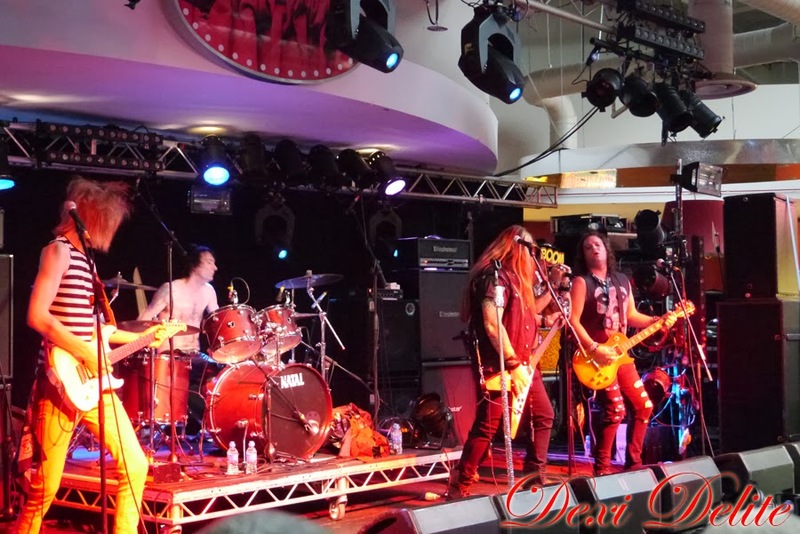 One of the things I noticed about Hard Rock Hell was the great feeling of camaraderie and safety, despite a few thousands boozed up rockers in attendance, I felt perfectly safe wandering on my own - something I probably wouldn't do in some of the city centre bar areas on a weekend night. A band were setting up on the smaller Jagermeister stage as I walked in. "Oooh, good," I thought, "I may stay and listen for a song or two." It was the end of their set before I left - they were called Wildside Riot, and their brilliant sleazy rock was just the thing to get the day going. From there I wandered over to the 'Unplugged' stage, so see Mia Klose (and hopefully my friends who may have dragged themselves out of bed). 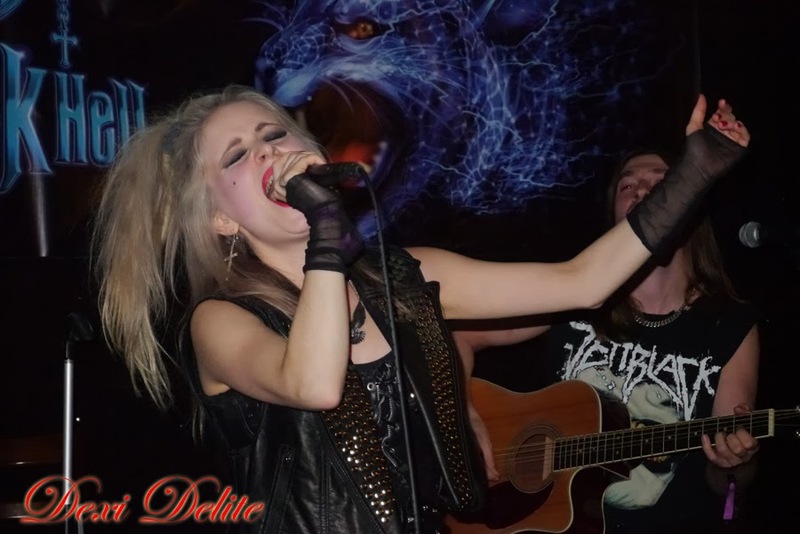 Mia Klose is a Swedish blonde beauty, very petite and lovely, and her acoustic set was at the other end of the spectrum from Wildside Riot. She showed she was a real professional however, when the sound really did go off for a while (truly 'unplugged') but carried on singing her heart out. After a quick mid-afternoon siesta back in the chalet, it was time to head back to the main arena for some more entertainment. I'd certainly taken a number of outfits, not being too sure of what the weather would be like. It was surprisingly mild in Wales, however, so my skin-hugging leopard print dress would be perfect for the night ahead. Phil Campbell (the Motorhead guitarist) was still midway through a great set when we arrived, and a storming finale saw the night set up for the big band on the Friday night - Black Star Riders. 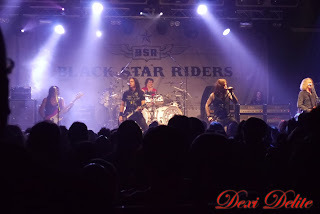 Black Star Riders are the remnants of what were Thin Lizzy, the legendary rock group of the 70's and 80's, and there was a huge and loyal cheer as they took the stage. They were bloody fantastic - the new songs blending in perfectly with the old Lizzy classics. 'Bound For Glory', from the new album, had already lifted the ceiling, but it was the two Lizzy anthems 'The Cowboy Song' and 'The Boys Are Back In Town' which completely blew it away. 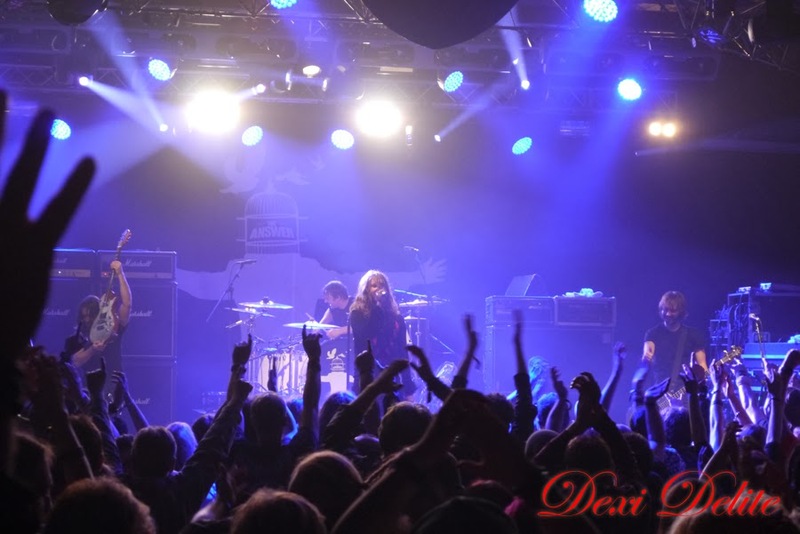 They left the stage to huge applause, and the shouting, clapping and cheering continued until they came back on - this time with Motorhead's Phil Campbell in tow. They proceeded to rip through and astonishing version of 'Rosalie', and left the stage finally to an even bigger ovation than before. I woke up on a very bright and sunny Saturday morning with my ears still ringing a little, and reminded myself that ear-plugs perhaps would have been a good idea. I pulled on my skin-tight leather-look dress and headed off once again to the stage areas. First off were two ex-Iron Maiden vocalists - Blaze Bailey, followed by Paul D'ianno, on his final ever gig. Both were OK, but couldn't match the energy of Friday's headliners. 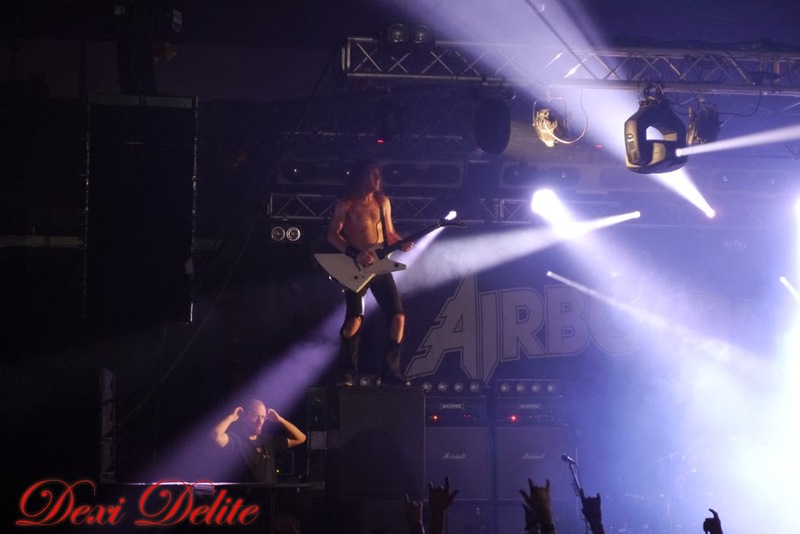 That all changed, however, when Aussie rockers Airbourne hit the stage. 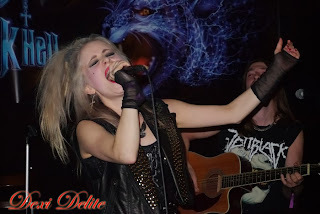 Heavily influenced by AC/DC, they have somehow managed to update their fellow countrymen's sound. Accordingly, the whole main stage arena became one big party for the next one and a half hours. They even pipped Black Star Riders to the best band of the weekend. Highlights - Joel O'Keeffe, lead vocalist and guitarist, running into the crowd whilst still playing and even cracking beer cans (sorry, tinnies!) open with his head. Infectious good humour and pounding songs - totally brilliant. It was an impossible act to follow, but Irish rock band The Answer did their best - and even came very close. As Airbourne have taken the AC/DC sound to a new generation, The Answer similarly take the classic Led Zeppelin sound and recreate it. Thunderous riffs and screaming vocals, The Answer were a perfect end to an utterly superb and unforgettable weekend. I have already booked for next year - there are very few tickets left with a year to go! I'm now counting down to November 2014!